Edited to add: I was so happy to be chosen as the TOP SPOT at Art Impressions – Challenge #230 Good Goes Round! Thanks so much! I was also fortunate to be selected as a Happy Little Stampers – April Mixed Media Challenge – Travel. Here we are back again with Kath’s new challenge over at Watercooler Wednesday Challenge this week. I have just returned from a holiday in South Australia, where I visited a couple of lighthouses, which I just love. As I had also recently received the wonderful new Lighthouse Circlet Mini Tryfolds stamp set from Art Impressions, I decided it was perfect for this week’s challenge. As it is a trifold card, it is really difficult to photograph clearly. On the back of the packet are very clear instructions for the using the 3 stamps and 2 mini die cuts to create the look through circle card. My card is slightly taller (5″), rather than the 4″ suggested, as I wanted to play around with a background. After stamping and die cutting each of the 3 circles, I water coloured the scenes using Distress Inks. I then added a little white paint to the wave caps to make it a bit more realistic. I wanted my card to give the impression of looking through an old brick wall across to the wonderful views. Unfortunately, when I checked, I didn’t have a brick stencil, but I found a Kaisercraft die. So I cut a stencil using an old piece of packaging – not too strong, but perfect for a decayed look. Using white Ranger Texture Paste, I added some bricks to the front, the second panel and on the inside of the back panel. To give the impression of the wall decaying, I used Sizzix Tim Holtz Alterations die to cut the top RH corner of the front and top LH of the middle panel. As I didn’t want the shapes, I just cut off the die cuts to leave an uneven shape. On the back panel, I added a circle using Mama Elephant – Sew Fancy Creative Cuts. I used the banner die from this set and stamped the sentiment from MFT – All Smiles set. To finish, I added three small, craft die cut shells from Memory Box Seaside Treasures. Sorry this has been such a long post! Now it’s over to you! Don’t forget to check out the clever creations from the rest of the talented Design Team members at our blog. 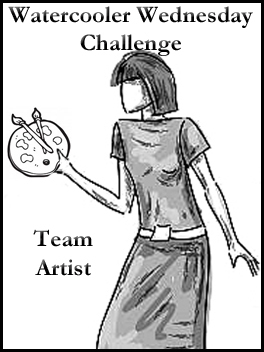 Art Impressions – Challenge #230 Good Goes Round! What a super FUN card!!! Love this! Great concept! Great execution! Amazing, Helen! I read your post and admired each panel and am left in awe of your wonderful creation. You’ve created a real masterpiece here. Love the lengths to which you went to follow your creative Muse. There is nothing about this card which I don’t absolutely love. You’re comments ae always so supportive, Heidi! Thanks so much! These tryfolds are such a clever idea and your card creation is wondeful, love how you have added the brick detail! Love how you made this card, with those windows and beautiful details and different views. Thanks so much for playing along at Time Out. I really appreciate your very kind comments, Joyce! Those tri fold card are a little tricky and time consuming but you have made an amazing card here Helen. Love the colourful lighthouse. Love the texture pasting wall and the uneven shaping. Fabulous card. I really appreciate your kind comments, Ina! Well Helen, your persistence in figuring out these tri-folds has really paid off with this beautiful card. I love lighthouse cards, and the wonderful triple scene you’ve created with the different views of the ocean and lighthouse in your card are really amazing. The cut-away on the walls front and back also lends to the mystery and beauty of this card. You continue to amaze me each and every time with your wonderful creativeness. WOW this is awesome! Thanks so much for playing in our ‘Springtime’ challenge at Dies R Us. Good Luck and please come back again soon! I really appreciate your kind comments, Darlene! What a stunning card! I’m so glad you linked up to the DRU “Springtime” challenge. Best of luck to you! I really appreciate your kind comments, Birgit! A brilliant card. I love how all the layers fit together. Thank you for joining us at Cardz 4 Guyz. Sian. I really appreciate your kind comments, Jill! It was so much fun to create! Love these new sets! I really appreciate your kind comments, Anita! I love light houses and the sea, wonderful cards. SO glad you could join us at Die Cut Divas. A girl after my won heart! Thanks so much. Amazing card, love the design, fold and all the details! So happy you could share this with us at Happy Little Stampers Anything Goes w/ Dies Challenge and good luck! I admire your creativity. This card is unusual and very beautiful. Thank you for sharing this beautiful card with us. What an awesome card! I love all the texture.Thanks for joining us at Dies R Us! I really appreciate your very kind comments, Laurie!